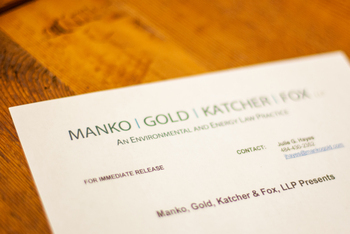 Philadelphia, PA (April 27, 2010) – Jonathan Spergel, a partner with Manko, Gold, Katcher & Fox, LLP, spoke on April 20 at the three-day 15th Annual Business of Brownfields Conference, in Pittsburgh, Pennsylvania. Spergel's seminar, "Overcoming Hurdles to Redevelopment - A Case Study of Technical, Economic, and Interpersonal Challenges," discussed the unique and challenging redevelopment of the former National Lead Brownfields site in Sayreville, New Jersey. Spergel moderated a panel of experts who discussed the myriad of challenges associated with this brownfields redevelopment.